The great thing about technology these days is that anyone can get in on the action. With a can-do DIY spirit, makers like Staffan Dryselius or Noah Zerkin (where have you been, Noah! ), have been breaking new ground with their inventions. technical details on your wearable computer project. What is the end goal? Or is this an ever evolving project? first goal is continuous access to Emacs and a keyboard. have a keyboard without lugging a piece of plastic around. Tom: What do you think of the other DIY projects out there, like Staffan’s? the outrageous sunglasses people gladly wear. Tom: How do you plan to use your wearable computer on a daily basis? etc. The basic idea is to augment my highly unreliable memory. Tom: I see one of your favorite books is Accelerando by Charles Stross. If you could, would you upload? Martin: It’s on my todo list. 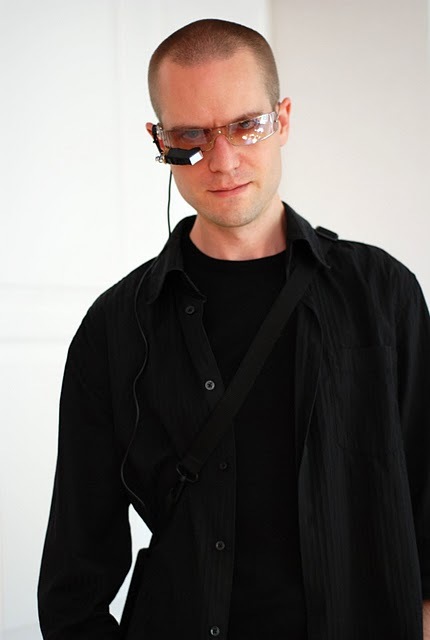 Martin is rigorously documenting his quest on his website Becoming Cyborg. I’ve been impressed with his progress in a short amount of time. Hopefully, he can keep up the pace. I highly recommend going back and starting from the beginning on his blog. He’s really done an excellent job in explaining step-by-step how he’s progressed and hopefully we’ll be hearing more from him in the future. Have you ever considered about including a little bit more than just your articles? I mean, what you say is important and everything. But think of if you added some great graphics or videos to give your posts more, “pop”! Your content is excellent but with images and videos, this blog could certainly be one of the best in its niche. Awesome blog! uxM6jD That’s really thinking out of the box. Thanks!